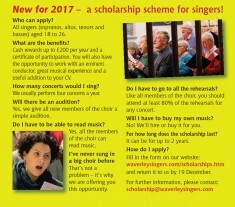 All singers (sopranos, altos, tenors and basses) aged 18 to 26. Cash rewards up to £200 per year and a certificate of participation. You will also have the opportunity to work with an eminent conductor, great musical experience and a useful addition to your CV. How many concerts would I sing? We usually perform four concerts a year. Yes, we give all new members of the choir a simple audition. Yes, all the members of the choir can read music. That’s not a problem – it's why we are offering you this opportunity. Do I have to go to all the rehearsals? Like all members of the choir, you should attend at least 80% of the rehearsals for any concert. Will I have to buy my own music? No! We’ll hire or buy it for you. For how long does the scholarship last? It can be for up to 2 years. Download and fill in the form on this page (top right) and return it to us - no current deadline. We are looking for a maximum of four young choral singers, preferably one each soprano, alto, tenor and bass voices. You don’t have to be a solo singer, and your previous musical experience could be on an instrument. You might be considering taking your musical studies further, or already have musical qualifications, though this is not essential. You will need to have some music reading ability, and be available on the dates of our forthcoming concerts. We rehearse on Thursday evenings at South Farnham School, close to Farnham railway station. Ideally you will be available to join us from September 2018, and the Scholarship could last for up to two years. How will the Scholars benefit? The Scholars are guaranteed a wonderful musical experience working with our eminent conductor, Richard Pearce. The choir learns and performs a broad range of repertoire, which in the coming year will include Britten, Handel, opera choruses and more. Subject to satisfactory involvement, at the end of the year you will receive a bursary of £200 and a certificate of participation, which will be a positive addition to your CV. Please fill out the application form and return it electronically, and also send us a paper copy as instructed.